Complementary and alternative medicine treatment for insomnia has been sought due to the possible adverse effects of conventional pharmacotherapies. We performed a preliminary evaluation of the feasibility of using, and of the effect of a herbal tea (HT002), based on Traditional East Asian Medicine, in mild-to-moderate insomnia. Patients (n = 40) with mild-to-moderate insomnia were randomized to the HT002 (n = 20) or waitlist (n = 20) groups. The HT002 group consumed HT002 twice daily for 4 weeks. Outcomes were assessed using the Insomnia Severity Scale (ISI), Pittsburgh Sleep Quality Index(PSQI), and 12-item Short Form Health Survey (SF-12) at baseline and after 4 and 8 weeks. The ISI score differences from baseline at weeks 4 and 8 were significantly greater in the HT002 than that in the waitlist group (week 4: −4.0 ± 0.8 vs. −0.4 ± 0.8, p < 0.05; week 8: −4.8 ± 0.7 vs. −0.9 ± 0.7, p < 0.05). Changes in PSQI and SF-12 physical component scores in the HT002 group were significantly greater at weeks 4 and 8 (p < 0.05), while SF-12 mental component scores were only significantly larger at 4 weeks (p < 0.05). HT002 was well-tolerated, with only one (5.0%) dropout, and no significant mean liver and renal function test changes post-treatment. Our preliminary results suggest that a 4-week treatment with HT002 may reduce the severity of insomnia symptoms and improve the quality of life. Further studies devoid of the limitations of our protocol may provide stronger conclusions. Sleep is integral to life1. Although insufficient or disrupted sleep increases the risk of multiple pathological conditions, including cardiovascular disease2, we know little about the cellular and molecular mechanisms by which sleep maintains cardiovascular health. Here we report that sleep regulates haematopoiesis and protects against atherosclerosis in mice. We show that mice subjected to sleep fragmentation produce more Ly-6Chigh monocytes, develop larger atherosclerotic lesions and produce less hypocretin—a stimulatory and wake-promoting neuropeptide—in the lateral hypothalamus. Hypocretin controls myelopoiesis by restricting the production of CSF1 by hypocretin-receptor-expressing pre-neutrophils in the bone marrow. Whereas hypocretin-null and haematopoietic hypocretin-receptor-null mice develop monocytosis and accelerated atherosclerosis, sleep-fragmented mice with either haematopoietic CSF1 deficiency or hypocretin supplementation have reduced numbers of circulating monocytes and smaller atherosclerotic lesions. Together, these results identify a neuro-immune axis that links sleep to haematopoiesis and atherosclerosis. Background/Purpose. Sleep plays an important role in individuals’ health. The functions of the brain, the cardiovascular system, the immune system, and the metabolic system are closely associated with sleep. As a prevalent sleep disorder, insomnia has been closely concerned, and it is necessary to find effective therapies. In recent years, a growing body of studies has shown that mind-body therapies (MBTs) can improve sleep quality and ameliorate insomnia severity. However, a comprehensive and overall systematic review has not been conducted. In order to examine the effect of MBTs on insomnia, we conducted a systematic review and meta-analysis evaluating the effects of MBTs on sleep quality in healthy adults and clinical populations. Methods. PubMed, EMBASE, the Cochrane Library, and review of references were searched up to July 2018. English language studies of all designs evaluating the effect of MBTs on sleep outcomes in adults with or without diseases were examined. To calculate the SMDs and 95% CIs, we used a fixed effect model when heterogeneity was negligible and a random effect model when heterogeneity was significant. Results. 49 studies covering 4506 participants published between 2004 and 2018 were identified. Interventions included meditation, tai chi, qigong, and yoga which lasted 4 to 24 weeks. The MBTs resulted in statistically significant improvement in sleep quality and reduction on insomnia severity but no significant effects on sleep quantity indices, which were measured by sleep diary or objective measures. We analyzed the effects of tai chi and qigong separately as two different MBTs for the first time and found that qigong had a slight advantage over tai chi in the improvement of sleep quality. Subgroup analyses revealed that the effect of MBTs on sleep quality in healthy individuals was larger than clinical populations. The effect of MBTs might be influenced by the intervention duration but not the frequency. Conclusions. MBTs can be effective in treating insomnia and improving sleep quality for healthy individuals and clinical patients. More high-quality and well-controlled RCTs are needed to make a better conclusion in further study. Wang Qun, Chair Sek Ying, Wong Eliza Mi Ling, and Li Xiaomei. ​Objectives: To examine the effects of music intervention on sleep quality in community-dwelling elderly people. Settings: Four urban communities in Xi`an, China. Participants: People aged 60 years or older with poor sleep quality (Pittsburgh Sleep Quality Index [PSQI] score >7). Interventions: All participants received one sleep hygiene education session and biweekly telephone calls. Each participant in the intervention group received an MP3 player with a music database. The participants selected the preferred music and listened for 30–45 minutes per night for 3 months. Outcome measures: Sleep quality, the main study outcome, was measured by PSQI at baseline, 1 month, 2 months, and 3 months. Results: Sixty-four elderly people with a mean age of 69.38 ± 5.46 years were randomly assigned to the control group (n = 32) or the intervention group (n = 32). All participants completed the study, and none reported discomfort related to the music intervention. The intervention group demonstrated continuous improvements in sleep quality, with a global PSQI score of 13.53 at baseline, 9.28 at 1 month, 8.28 at 2 months, and 7.28 at 3 months. Although the global PSQI score in the control group also decreased from 12.26 at baseline to 8.72 at 3 months, the intervention group achieved greater improvements at each measurement (all p < 0.05). Repeated-measures analysis of variance revealed significant group-by-time interaction effects in global PSQI score and three component scores: sleep latency, sleep efficiency, and daytime dysfunction (all p < 0.05). Conclusion: Music is a safe and effective nonpharmacological intervention for improving the sleep quality of community-dwelling elderly people, especially in improving sleep latency, sleep efficiency, and daytime dysfunction. Lillehei AS, Halcón LL, Savik K, Reis R. Effect of inhaled lavender and sleep hygiene on self-reported sleep issues: A randomized controlled trial. J Altern Complement Med. 2015;21(7):430-438. Sleep problems are associated with numerous health concerns such as anxiety, depression, cardiovascular disease, hypertension, inflammation, obesity, impaired glucose tolerance, and diabetes. Essential oils, such as lavender (Lavandula angustifolia, Lamiaceae) flower, which have sedative or hypnotic properties, have been evaluated for sleep therapy. The purpose of this randomized, double-blind, placebo-controlled study was to evaluate the effect of inhaled lavender essential oil on sleep quality and quantity in college students. Students (n = 79, aged 18-36 years) with self-reported sleep issues (difficulty falling asleep, frequent awakenings during the night, or daytime sleepiness) were recruited from the University of Minnesota, Minneapolis, Minnesota, campus. Students were excluded if they were pregnant, working a night shift, or used prescription sleep medication. All subjects received sleep hygiene information based on the National Institutes of Health (NIH) recommendations—specifically, (1) maintain a regular sleep schedule; (2) avoid fluid intake before bed and food, caffeine, alcohol, and nicotine late in the day; (3) create a good sleeping environment (e.g., wear ear plugs and a sleep mask, and avoid screens and texting); (4) create a relaxing bedtime routine; (5) keep up with school work; and (6) exercise regularly. Each 3-cm adhesive patch contained a 1-cm disc of absorbent material impregnated with 55 µL lavender oil (supplied by Wyndmere Naturals, Inc.; Minnetonka, Minnesota) or left blank (placebo). Based on the gas chromatography-mass spectrometry (GC-MS) analysis provided to the principal investigator, "the essential oil used was chemically consistent with the International Organization for Standardization (ISO) for L. angustifolia. "The patch (supplied by Bioesse Technologies, LLC; Minnetonka, Minnesota) had a skin-barrier backing to prevent skin absorption of the essential oil and a time-release function to last 6-8 hours. For 5 consecutive nights, subjects applied a patch on their mid-upper chest at bedtime and removed it in the morning. Sleep quantity was measured via a Fitbit® tracker (to measure movement during sleep) and sleep diary, and sleep quality was measured with the Pittsburgh Sleep Quality Index (PSQI) and the NIH Patient-Reported Outcomes Measurement Information System (PROMIS) sleep disturbance short form. Subjects also completed a sleep hygiene survey (SHS). Assessments were made at baseline, at day 5, and 2 weeks after the completion of treatment. The majority of the subjects were white (67%) and female (69%); both treatment groups had similar demographics. There were technical issues with the Fitbit, resulting in unacceptable levels of missing data (only 14% of the data were recovered). The patches were reported to have fallen off during sleep in 37% of the person nights (n = 146); however, the data analysis indicated that the patch falling off was not a significant covariate. Based on SHS scores, sleep hygiene was better during the 5-day treatment phase compared to baseline and post-treatment in both groups; there were no significant differences in SHS scores between groups at any time point. Based on the PSQI, both groups had poor sleep before the intervention, and there was no difference between groups at baseline. Post-treatment, sleep quantity did not significantly differ between groups; both groups had a significant decrease in awakenings (P = 0.02) and increase in being able to fall asleep easily (P = 0.001). The PSQI and PROMIS assessments indicated that sleep quality was significantly better for the lavender group compared with the sleep hygiene-only group at day 5 (P = 0.01 and P = 0.04, respectively) and at follow-up (P ≤ 0.001 and P = 0.007, respectively). Better sleep hygiene was also associated with better sleep quality but to a much lesser degree at day 5 (P = 0.02 and P = 0.03, respectively) and at follow-up (P = 0.03, PROMIS only). The lavender group had a clinically significant improvement in sleep quality, while there was no clinically significant change in sleep quality in the sleep hygiene-only group. The lavender group had less daytime fatigue at day 5 and follow-up (P = 0.02 and P = 0.009, respectively) and was more likely to wake refreshed at day 5 (P = 0.01). The 4 adverse event reports (minor skin irritation, each lasting 1 night) were attributed to the patch adhesive. The authors conclude that, in college students with self-reported sleep issues, lavender essential oil inhalation improved sleep quality, and the effect persisted for 2 weeks after lavender aromatherapy was suspended. "The persistent effect of lavender on sleep quality at two-week follow-up suggests a re-balancing or long-acting effect on the sleep cycle, although the exact mechanism of action is unknown." The limitations of the study were the lack of statistical power to evaluate potential differences due to race or ethnicity, the loss of objective Fitbit data regarding sleep quantity, the subjective self-reporting nature of the data, the lack of standardized dosages due to the poor patch adherence, and the potential failure of subject blinding due to the lavender scent. The authors conclude that this trial "supports the use of lavender and sleep hygiene as safe, accessible, and effective interventions for self-reported sleep issues in college students. Further research to study their effect on other populations and additional studies exploring the duration of intervention effects are needed." Alcohol is a potent somnogen and one of the most commonly used “over the counter” sleep aids. In healthy non-alcoholics, acute alcohol decreases sleep latency, consolidates and increases the quality (delta power) and quantity of NREM sleep during the first half of the night. However, sleep is disrupted during the second half. Alcoholics, both during drinking periods and during abstinences, suffer from a multitude of sleep disruptions manifested by profound insomnia, excessive daytime sleepiness, and altered sleep architecture. Furthermore, subjective and objective indicators of sleep disturbances are predictors of relapse. Finally, within the USA, it is estimated that societal costs of alcohol-related sleep disorders exceeds $18 billion. Thus, although alcohol-associated sleep problems have significant economic and clinical consequences, very little is known about how and where alcohol acts to affect sleep. In this review, we have described our attempts to unravel the mechanism of alcohol-induced sleep disruptions. We have conducted a series of experiments using two different species, rats and mice, as animal models. We performed microdialysis, immunohistochemical, pharmacological, sleep deprivation and lesion studies which suggest that the sleep-promoting effects of alcohol may be mediated via alcohol's action on the mediators of sleep homeostasis: adenosine (AD) and the wake-promoting cholinergic neurons of the basal forebrain (BF). Alcohol, via its action on AD uptake, increases extracellular AD resulting in the inhibition of BF wake-promoting neurons. Since binge alcohol consumption is a highly prevalent pattern of alcohol consumption and disrupts sleep, we examined the effects of binge drinking on sleep-wakefulness. Our results suggest that disrupted sleep homeostasis may be the primary cause of sleep disruption observed following binge drinking. Finally, we have also shown that sleep disruptions observed during acute withdrawal, are caused due to impaired sleep homeostasis. In conclusion, we suggest that alcohol may disrupt sleep homeostasis to cause sleep disruptions. Methods:Eligible patients were enrolled into this descriptive pilot study and received AAT designed to manage insomnia for 4 weeks. Questionnaires that used the Pittsburgh sleep quality index (PSQI) were completed at baseline, after a 4-week intervention, and 1 month after completion of treatment. Sleep quality and other clinical characteristics, including sleeping pills taken, were statistically compared between different time points. Results:A total of 22 patients were selected as eligible participants and completed the treatment and questionnaires. The mean global PSQI score was significantly decreased after AAT intervention (p<0.05). Participants reported improved sleep quality (p<0.01), shorter sleep latency (p<0.05), less sleep disturbance(p<0.01), and less daytime dysfunction (p=0.01). They also exhibited less dependency on sleep medications,indicated by the reduction in weekly estazolam consumption from 6.98–4.44 pills to 4.23–2.66 pills(p<0.01). However, these improvements were not preserved 1 month after treatment. Conclusion:In this single-center pilot study, complementary AAT for MHD patients with severe insomnia wasfeasible and well tolerated and showed encouraging results for sleep quality. 1Department of Physical Medicine and Rehabilitation, Chang Gung Memorial Hospital at Taoyuan/Linkou, Taoyuan, Taiwan.2School of Medicine, Chang Gung University, Taoyuan, Taiwan.3Healthy Aging Research Center, Chang Gung University, Taoyuan, Taiwan.4Division of Pulmonary and Critical Care Medicine, Sleep Center, Chang Gung Memorial Hospital at Taoyuan, Taoyuan, Taiwan.5Graduate Institute of Rehabilitation Science, Chang Gung University, Taoyuan, Taiwan. Objectives: To investigate the effect of sedative music on the different stages of the sleep cycle in young adults with various sleep latencies by using polysomnography (PSG). Design: Prospective, randomized, controlled, crossover study. Setting: Sleep center of a teaching hospital. Participants: Young adults with different sleep latencies. Poor sleepers (Pittsburgh Sleep Quality Index score ≥5) were excluded. Interventions: Each participant stayed one night in the sleep center for adaptation and on each of the following two nights was assigned to (1) music and (2) control (without music) conditions in random order. In the music condition, sedative music composed by certified music therapists was played on a compact disc player for the first hour the participant was in bed. Outcome measures: Sleep measures recorded with PSG, including sleep latency and durations of sleep stages. Results: Twenty-four young adults (mean±standard deviation, 24.5±2.6 years) participated. They were classified into the short sleep latency (SL) group if the baseline SL of the adaptation night was shorter than 10 minutes or into the long SL group if the baseline SL was 10 minutes or longer. Sedative music did not alter the SL in either group. Sedative music reduced stage II sleep in both SL groups (main effect of music, p=0.03; interaction effect, p=0.87) but increased the duration of deep sleep (stages III and IV) only in the long SL group (main effect of music, p=0.15; interaction effect, p=0.02). Conclusions: In participants with long SL, sedative music improved the quality of sleep by prolonging the duration of deep sleep. This effect provides an alternative and noninvasive way to improve sleep in selected persons experiencing sleep problems. Sleep is one of the few, universal behaviours. Humans spend approximately 8 hours/day, 56 hours/week, 224 hours/month and 2,688 hours/year sleeping. One third of a human beings life is spent sleeping. And despite centuries of inquiry, scientists have still not reached a consensus on why we sleep. There are many theories as to why we sleep: one suggestion is that sleep kept our evolutionary ancestors safe during the night time hours when predators roamed the land. However, the most widely accepted view is that sleep is anabolic it restores depleted energy resources and dissipates accumulated wastes. Sleep follows a regular cycle each night. These stages have been documented using a polygraph which records the electrical activity in the brain. The recordings produce an electrocephogram (EEG). When a person is alert, the EEG shows irregular tracings of high-frequency, low amplitude waves known as beta activity. When a person is relaxed or in a drowsy state; alpha activity of medium frequency, medium amplitude rhythms occur. The first stage of sleep is a transitional period between wakefulness and sleep. It is characterised by theta activity and muscle movement, especially the eye area. The progression of sleep through stages 2,3, and 4 becomes deeper. Recordings on the EEG get progressively lower in frequency and higher in amplitude. Stage 4 consists mainly of delta activity, characterised by relatively high-amplitude waves occurring. The sleeper becomes less responsive to the environment and more difficult to waken. Any environmental stimuli that caused the sleeper to stir during stage 1, will produce little or no reaction in stage 4. Stages 3 and 4 of sleep are also known as slow wave sleep, which usually lasts approximately half an hour before the EEG begins to indicate lighter levels of sleep, back through stages 3 and 2 to the activity characteristic of stage 1. The sleeper’s heartbeat becomes irregular and respiration alternates between shallow breaths and sudden gasps. The sleeper’s eyes dart rapidly back and forth, up and down and at this point the rapid eye movement (REM) phase of sleep has been reached. REM sleep is associated with dreaming, although it may also occur during the first four stages (Non-REM) of sleep. EEG readings during REM sleep are similar to that of an active brain, but it is almost impossible to wake the sleeper, as this is the deepest stage of sleep. The stages of Non-REM and REM sleep alternative throughout one’s sleep in roughly 90 minute cycles. The duration and sequences of the sleep stages may vary as the night progresses. - medical conditions e.g. hypoglycaemia. In fields and meadows and wild woods, people have for centuries been collecting herbs to use as medicine. Vast amounts of information have been collected and tested, much of this information had never been written down, but had been passed on verbally instead. The exact reason for the healing effect of herbs is not always known. The therapeutic action of herbs comes from alkaloids, organic nitrogenous compounds that cause certain chemical reactions within the body. Herbs also contain glycosides, tannins, minerals, vitamins and salts that help the body to resist disease, strengthen tissues, and improve the nervous system. Giving a naturally extracted dose of a whole herb ensures a gentle, safe, alternative to allopathic medicine. However, herbs can be potent, moderation needs to be practiced and if an herb does not agree or adverse effects are felt, then discontinue using the herb and find an alternative, nature has many to offer. In some individuals Valerian can aggravate a sensation of tiredness or drowsiness, particularly in higher doses, but this is usually more a case of an increased awareness of the body’s needs rather than a negative depressant effect. A few individuals find Valerian stimulating and should avoid its use. Again this can become more apparent at higher doses. While much of the research has concentrated on the effects of the essential oil for its sedative activity current opinion makes only a minor contribution to the oils activity (about one third) and recent attention has focussed on the valepotriates, an unusual group of iridoid esters, and also their decomposition products. The characteristic odour of Valerian is due to isovaleric acid, a volatile compound which is mainly formed from decomposition of the essential oil and valepotriates, it has negligible pharmacological activity. Valepotriates were studied and compared to chlorpromazine (an anti-psychotic drug), it was shown that their sedative effect was weaker, but unlike chlorpromazine they actually improved co-ordination. Tests on cats showed no decrease in reactivity but decreases in anxiety and aggression. Whereas diazepam (Valium) increases the toxicity of alcohol, no such effect occurred with valepotriates. Valepotriates also exert a spasmolytic effect and EEG studies have shown that some exhibit anti-depressant effects while others are transquilizing. Some valepotriates have shown pronounced cytotoxicity in vitro and this caused concern over the safety of Valerian, however, subsequent research indicates that the valepotriates are not cytotoxic when given orally – the unstable valepotriates do not survive the acidity of the stomach. The efficiency and tolerance of a Valerian tablet (Valerian officinalis) was evaluated against placebo in the treatment of insomnia. A double blind study was conducted on 121 patients with diagnosed insomnia not due to organic causes. Patients were studied over 4 weeks and the daily dose was 600mg taken in the evening. Passion flower is a simple, uncomplicated sedative. It addresses restlessness, insomnia, stress and anxiety. It slows the pulse, decreases arterial tension and quiets respiration and pulmonary blood pressure. - Alkaloids, small amounts including harmol, harmine, Harman and passiflorine. - Flavonoids, about 1%, including vitexin, iro-orientin, luteolin and apigenin. - The plant also contains chlorogenic acid, maltol, gynocardin (a cyanogenic glucoside) sterols and traces of volatile oil. The active constituents are not well characterised and there is/are no clear candidate(s) for the observed actions (sedative anxiolytic, antispasmodic). However the alkaloids which occur in other plants studied occur in small quantities in Passiflora and it is not certain that they are the main pharmacological agents. Whole extracts of the herb have been found to be depressant to the Central Nervous System, reducing locomotor activity and prolonging sleep. They are also anxiolytic at low dosage and sedative at higher dosage as well as being antispasmodic. There does appear to be a synergistic action from the various components of Passionflower. Chamomile has many active constituents, however, the volatile oils and the flavonoid fractions of the active constituents seem to exhibit the most activity. “Off the shelf” or “made to order” sleep tinctures or teas can be readily purchased. Vitamins are complex organic food substances found only in living things, that is, plants and animals, which are required by the body in very small amounts. Vitamins are needed for normal growth, reproduction and maintenance of health and life. Vitamins are important as cofactors of enzymes. They perform a regulatory function, they are essential in the regulation of biochemical reactions that convert absorbed foods into materials that can be used in the body. . Vitamins cannot be metabolised for energy but some are necessary for energy production. Vitamins function as antioxidants, free radical scavengers. Vitamin deficiency is not uncommon, many vitamins have been removed from many processed foods that constitute a typical western diet, sometimes some, but not all the vitamins are replaced by the manufacturer. Many weeks or even months are usually required for a vitamin deficiency to appear. Where there is doubt that the requirement for certain nutrients are being met through the diet alone, supplements may be ingested to offset any deficiency. Vitamin therapy does not produce results overnight. Regeneration or the alteration in the body chemistry necessary for repair takes weeks and sometimes months before the full benefits are felt. A change in food habits may also be necessary. Modern agriculture is a recipe for mineral deficiencies, soil has become deficient in many minerals and supplementation with minerals will correct any deficient state. 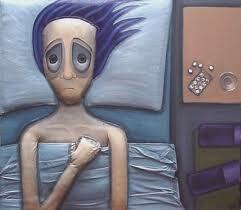 Nutrient deficiencies can cause insomnia, especially Calcium and Magnesium and the B group vitamins. Calcium is the most abundant mineral in the body. About 99 percent of the calcium in the body is deposited in bones and teeth. One percent is involved in the blood clotting process, in nerve and muscle stimulation, parathyroid hormone function and metabolism of Vitamin D.
As stated, Calcium is important in nerve transmission, Calcium ions influence nerve and cell membranes and the release of neurotransmitters. Calcium activates some enzyme systems such as choline acetylase, which helps generate acetylcholine an important neurotransmitter. Noradrenaline and serotonin are also affected by calcium. Calcium is calming to the nerves, as higher concentrations tend to decrease nerve irritability. Large amounts of phytic acid, present in cereals and grains may inhibit the absorption of calcium by the body, other interfering factors include lack of exercise, excessive stress, excitement, depression and too rapid a flow of food through the intestinal tract all interfere with the absorption and utilization of calcium. Magnesium is considered the ‘antistress’ mineral. It is a natural tranquilizer, as it functions to relax skeletal muscles as well as the smooth muscles of blood vessels and the gastrointestinal tract. Fatigue is often reduced with magnesium (and potassium) supplementation. The many enzyme systems that require magnesium help restore normal energy levels. Because of this function and its nerve and muscle support, magnesium may be helpful for nervousness, anxiety, insomnia, and depression and muscle cramps. People tend to sleep better after taking magnesium before bed. Magnesium deficiency can easily occur, the mineral is refined out of many foods during processing. The cooking of food removes magnesium. Magnesium deficiency can occur in many diseases e.g. diabetes, chronic alcoholism. Symptoms of magnesium deficiency may include apprehensiveness, muscle twitch, tremors, confusion, irregular heart rhythm, depression, irritability and disorientation. All the B vitamins are water-soluble, substances that can be cultivated from bacteria, yeasts, fungi or molds. Sulfa drugs, sleeping pills, insecticides and estrogen create a condition in the digestive tract which destroy B vitamins. B vitamins have been removed from processed foods, some may be replaced by the manufacturer. The high amount of sugar that is consumed in the western diet: Sugar produces an abnormal intestinal flora from which some of the B vitamins are manufactured. Sugar is a pure carbohydrate with no vitamins or minerals or enzymes to aid in its digestion. Therefore it takes nutrient supplies including the B vitamins, from other parts of the body, depleting those storage areas. Because of the water-solubility of the B-complex vitamins, any excess is excreted and not stored. Therefore they must be continually replaced. L-Tryptophan has been used effectively to treat insomnia in many people. Tryptophan depletion has a negative impact on sleep. L-Tryptophan is a naturally occurring amino acid essential for human metabolism. L-Tryptophan serves as a precursor to serotonin (chemically called 5-hydroxytryptomine) and melatonin. Serotonin is needed in the brain to induce and maintain sleep. Serotonin has a dramatic effect on mood. A deficiency of serotonin results in numerous sleep disorders, such as the inability to fall or stay asleep An entire class of antidepressant drugs (Selective Serotonin Reuptake Inhibitors – SSRIs e.g.Prozac, Zoloft) work by stopping the breakdown of serotonin in the brain thereby leaving more in the synapse to act as a neurotransmitter. L-Tryptophan naturally increases serotonin levels in the brain. Melatonin is a hormone secreted in the pineal gland (and the intestine) during the hours of darkness, it regulates our day/night cyclic cycles and seasonal rhythms. It is suggested that melatonin exerts a hypnotic effect through thermoregulatory mechanisms. By lowering core body temperature melatonin reduces arousal and increases sleep-propensity. The amount of melatonin produced by our body seems to lessen as we get older which may account for the fact that older people have problems sleeping. Melatonin is not licensed as a drug in most countries, although it is available without prescription in the USA. Usually 1-2 grams of L-tryptophan (the desired form) are needed to increase blood levels sufficiently to induce. Sleep. However, the lowest dose that works to aid sleep (often as little 500mg) should be maintained. It can be repeated if the person wakes in the middle of the night. As an initial treatment 1 gram of L-tryptophan 30-45 mins before bed, which reduces the time it takes to fall asleep (sleep latency period). Some formulas contain vitamin B6 and niacinamide, which improve tryptophan utilization. If 1 gram is insufficient, increase the dose 500 mg, each night up to a total of 3000 mg, and add calcium 300-600 mg., and magnesium 200-400 mg to your good night supplements. L-Tryptophan is not associated with side effects that are common with prescription drugs, nor does it usually cause difficulty waking up in the morning. High doses of the nonessential element aluminium (present in most antacids, in cooking vessels, cans, baking powder, softened water, contaminated soil) decrease sleep quality.